Over 30 teams competed, including 19 mainland teams. It's Sultana over Snohomish for the girls! Join us at our Sept. 18, 2004 meet ... No registration fee! Plenty of "Aloha Spirit" and "Hawaiian Hospitality" for all! -Victoria Chang, 1999 winner of the FootLocker National High School XC Championship and the 1999 Iolani XC Invitational. -Sara Bei, 2000 winner of the FootLocker National High School XC Championship and the 2000 Iolani XC Invitational. 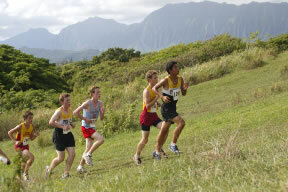 -Amber Trotter, 2001 winner of the FootLocker National High School XC Championship and the 2001 Iolani XC Invitational. 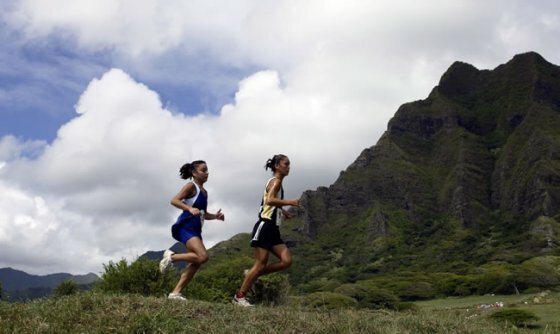 - Ruth Graham... 2002 Girls' Iolani XC Invitational Champion and 2002 finalist at the Footlocker Nationals.